Last spring, the Wall Street Journal unearthed a decades-old secret. Conspirators had come from all over the country to launch a complex plot from sleepy Williamsburg. They struck once and faded away — seemingly forever. They had taken nearly every precaution, told only a scarce few others and almost got away with it. In the end, NBA stars, Division I athletic departments and the Associated Press alike had been fooled: basketball’s Leo G. Hershberger Award was a hoax. In fall of 2012, the Wall Street Journal’s Rachel Bachman was on-campus in Gainesville, Fla., reporting on the University of Florida football team as part of their “Varsity Vetter” series. While she pursued a big-picture look at the school’s athletics program, sources suggested Bachman talk to Steve Noll ’74, a lecturer in the history department and walking Gators encyclopedia. But Noll proceeded to unwind the tale that would land him on the front page of the nation’s largest newspaper. In 1973, Steve Noll ’74, Tom Duncan ’74, Reed Bohne ’74 and Paul Pavlien ’74 created a fake association and doled out awards to 15 rookie basketball players. His friends were Tom Duncan ’74, Reed Bohne ’74 and Paul Pavlich ’74, all fellow members of 1973’s fictitious National Association of Collegiate Basketball Writers (NACBA) and former residents of Yates 3rd Center. 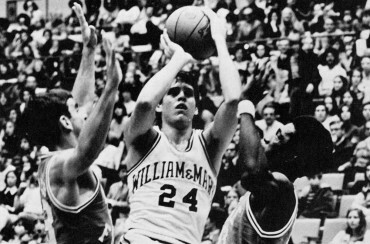 Inspired by the Tribe’s own unsung hoops star Mike Arizin ’76, the four William & Mary juniors decided to play a trick. They named Arizin and 14 other rookie basketball players as winners of the first and only Leo G. Hershberger Award. And then they hoped their deception wouldn’t get discovered — sort of. Pavlich estimates up to 40 people knew the secret, but “none of them had any inclination to go snitch on us.” Regardless, there were still many details to consider. Printing certificates and renting a post office box were important, but so was getting the right mix of players on the team. Co-conspirators with broad basketball knowledge were critical, as were Swem Library’s many subscriptions to nationwide papers. This was five years before ESPN and a quarter-century prior to Google. There were only a handful of college basketball games on TV per week, and they felt some players weren’t getting the attention they deserved. “[Arizin] was averaging 17 points per game,” said Noll. “[Current Kansas standout] Andrew Wiggins is only averaging 15 and he’s on the cover of Sports Illustrated.” The opportunity to poke fun at the negligent basketball establishment was too much to resist. “The team is something that a regular organization would have been proud to have as their recipients,” said Noll, “and we did it by newspaper.” Then the word got to the Associated Press and began to appear in places like the Hartfort Courant and Los Angeles Times. Noll, Duncan, Bohne and Pavlich even went so far as to use an old rubber mask to attend Tribe basketball games in disguise — as Leo G. Hershberger. Precisely how convincing a group of college juniors were in impersonating their own fictitious sportswriter is debatable, but there was no question that they had been thorough. the eve of March Madness. There was some fear that the pranked awardees might be offended, but the reaction was almost completely positive, if a little incredulous. Duncan was featured in an online video interview to accompany Bachman’s article; Noll’s face was immortalized in classic Wall Street Journal stipple potrait fashion. The attention was unfamiliar, but Duncan didn’t mind. “Anything we can do to help Tribe basketball, we’d be interested,” he said. Curiously, U.S. Figure Skating created its own, non-fictitious Hershberger Award in 2010. Noll keeps a framed Hershberger certificate in his office in Gainesville, where he first unveiled the hoax to the world. He’s also got yet another rubber mask. “Somehow while we were in college, we left [the original Hershberger mask] in the car and it melted,” said Noll. “So Leo is dead, but at my wedding these guys came with a very similar mask which became Leo’s brother Myron.” Myron stands vigilant near the Swamp to this day. All four men got together at Duncan’s daughter’s wedding in California last fall, gathering as always for a photo next to some familiar green and gold — adorn-ing the ubiquitous Waste Management dumpsters. This fall, the Class of ’74 will celebrate their 40th Reunion. As for old crusty Leo, like with the best tall tales, the truth is stranger than fiction.